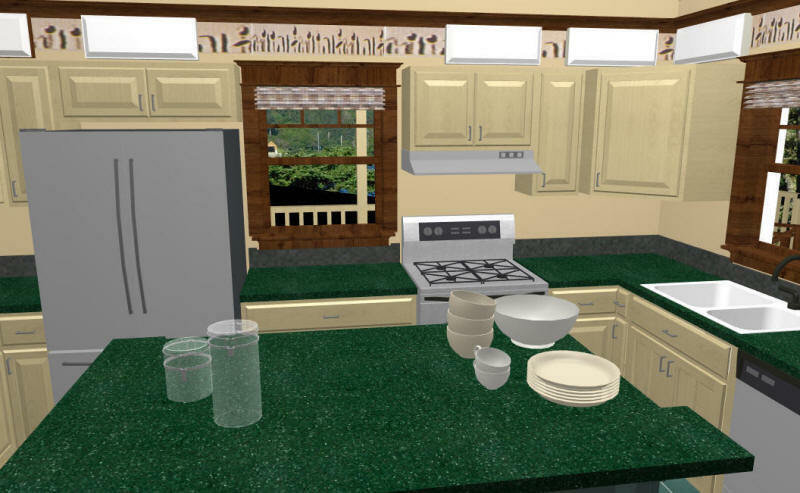 Shortly after the last update - we received the Chief Architect's "Better Homes and Gardens Home Designer Professional 7.0" software package we had ordered. I have been working for the last 2 months on the designs for the estate we hope to build in 2011 - after we retire back to Canada from Kuwait. The renderings are 3-D views of the plans - and are accurate, since they're from a digital model. 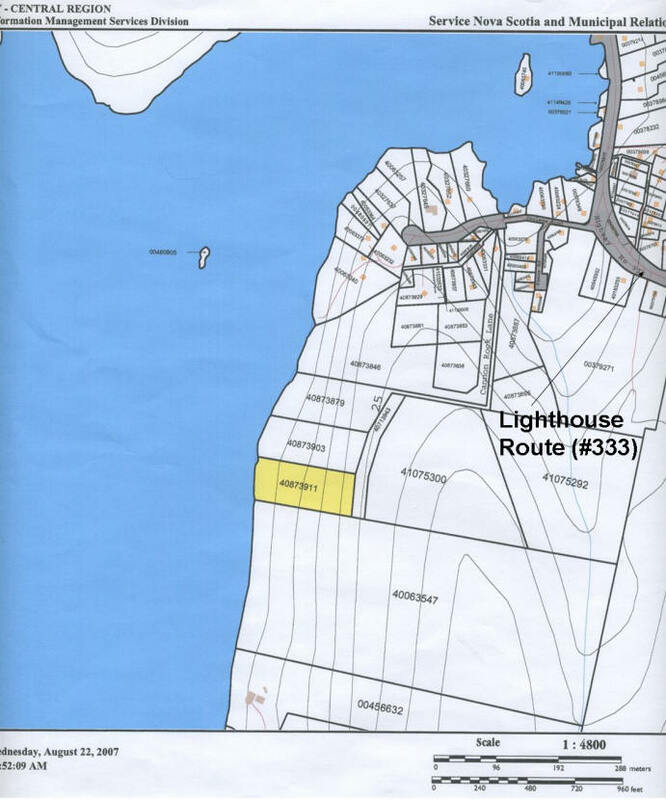 We have 2.53 acres with a 220' west-facing frontage on Shad Bay. 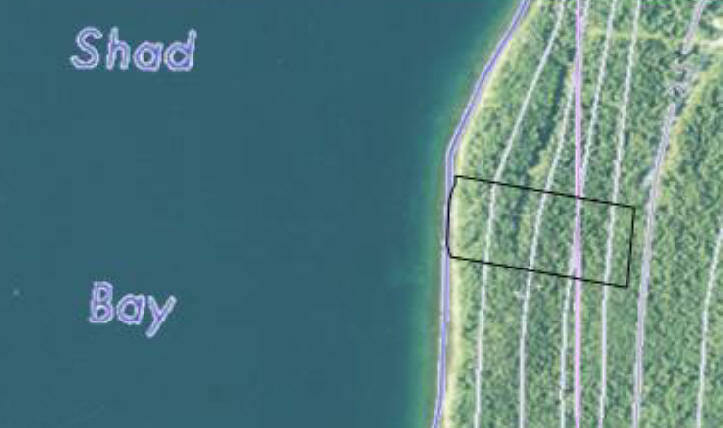 Road access on the eastern property line 500' from the ocean frontage, about 22-1/2 meters above sea level. 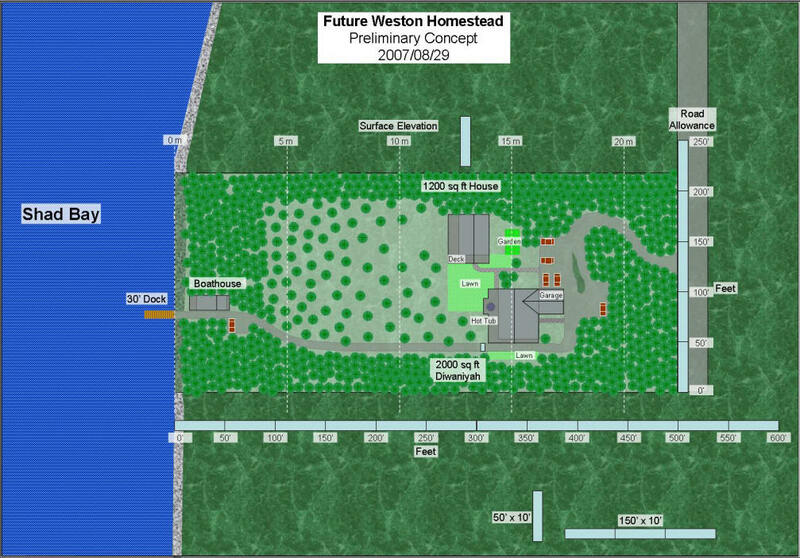 This is a rendering from the software, showing an eastern-facing view of the property from the water-side. The Boathouse is set about 5' above the high-tide mark, covered in large glacial-till derived boulders. The next building up dip is the Main House. About a 1400 square foot footprint, with a full walk-out basement, and a 2nd floor loft. The third building is our Diwaniyah. An external lodge, designed for entertainment and my retirement office space. 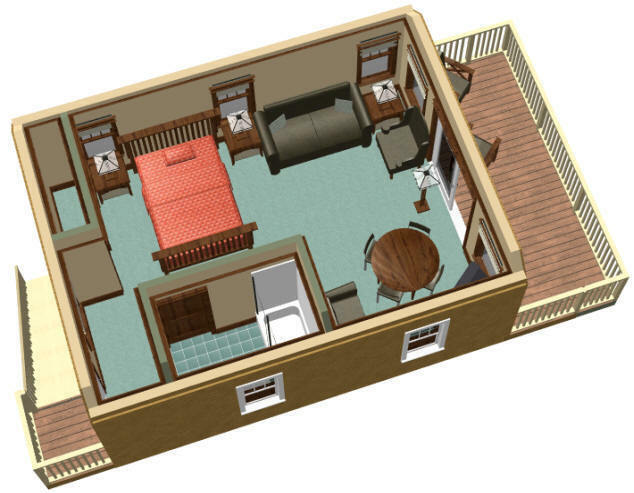 About a 2000 square foot footprint with an attached 2 car garage and a large 2nd floor loft. No basement. We've placed the main buildings in the center of the of the property for maximum privacy. Nothing should be visible from the property lines, except from the water-side. There is at least 40' of thick forest underbrush between the buildings and the neighbour's property lines north and south. They'll need to provide at least 30 more feet of a buffer zone as well - so there will be a minimum of 70' of heavy forest between what we build and what they build. We'll have no pavement as recommended by the protective covenants - opting for gravel on all the roads and paths. With minimal forest clearing. The gravel here is hard rock - not like the carbonates in Calgary. So there is almost no dust associated. Should keep vehicles and structure much cleaner than we experienced in Calgary. We will need a septic drainage field - so there is a tentative "lawn" in front of the Diwaniyah. Size subject to installation requirements. Another open patch in front of the house is for Alice's vegetable garden. I expect to drill a well on the eastern side of the property - surface structurally up dip of the septic field. We'll try to provide open parking for at least a half dozen cars for our social events, and a cleared pathway to the Boathouse and waterfront. Wide enough with sufficient turning radii for a medium sized runabout on a trailer. With additional parking by the Boathouse for our guests. The following are the buildings in detail. The Main House on the left, and the Diwaniyah on the right. We've taken a radical departure in concept from our previous building effort - on our Calgary acreage. Rather than build a large main house with lots of space for entertaining, and areas for privacy for family members affording everyone views. Instead we'll build a much smaller, intimate Main House - NOT designed for entertaining. The detached Diwaniyah will serve as a much better social center for our occasional parties and functions. I expect we'll be quite active with the local community groups - such as their Caledonian groups. I expect we'll join a pipe band as well - and after mastering the other instruments I have in mind - other musical groups. The nice thing about the east coast is that these groups have been well established for many years. A trait that boom-bust cities in Canada like Calgary can't boast. Two things we miss the most about our last house in Canada, were our fireplaces (4 in the Calgary house), and our Family Room hot tub. We don't have either here in Kuwait. So this design provides both in spades for us. Two fireplaces in both the house and the Diwaniyah, and a small hot tub in the Main House Family Room, and a larger entertainment hot tub in the Diwaniyah. As in Calgary - all of the rooms have been positioned to maximize the great sea view. All the rooms will have as much cross-flow as possible for the warmer months, and both buildings will have a passive solar design to lessen our heating requirements. And large over-hangs on south and west exposures to reduce overheating in the warmer months. And ceiling fans for maximum air flow to even out the temperatures. And a stone fireplace to provide insulated-space thermal mass to help regulate internal temperatures. We're trying to avoid the need for air conditioning, as well as heating. We'd rather receive revenues from oil sales than have to pay for them ourselves. As in Calgary - we've opted for an "Arts and Crafts" design for all our buildings. Ergonomics are far more important to us than aesthetics - and this shows in the house design where the Family Room (where we spend the most time out of bed), has been optimized for our lifestyle. I've left a smaller Dining Room and Living Room in the Main House for Alice's benefit. She'll no doubt want to have a friend in or two, once in a while. And the Family Room won't be set up for visitors. It isn't here in Kuwait - either. The classically styled Arts and Crafts Bungalow. Our own little Empty-Nester by the ocean. The Main House main floor plan. Wrap around deck on east, south and west side. Roof planes visible. Furniture visible. The Family Room. A very wide open concept with the loft overlooking the public-space of the main floor. We'll have a TV view from the smaller hot tub that overlooks the ocean view. Note the recliner chairs - each with networked computers for interactive entertainment (as in our present lifestyle). A fireplace also - of course. And plenty of book shelves for tapes, DVDs, CD's, and of course - books. Nothing worse than hiding everything away in storage where we can't see them - and forget we have them when we want them. And of course - everything is visible from the Kitchen, which is also part of the open space. We can work in the Kitchen and still be part of the Family Room space. This is the view from the Kitchen into the family room. A wide-angle view of the Family Room and Kitchen from the fireplace. The water view isn't exactly like this - but the water will be visible through those windows. Alice's Kitchen. Lots of storage and work space - along with a view to the Diwaniyah and to the south to the water - of course. 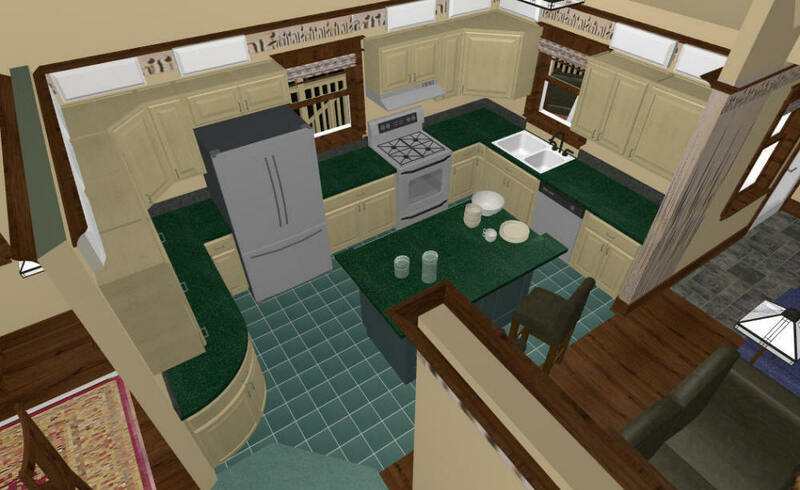 Another angle view of the Kitchen. A corner window gives a great view vantage point. As well as overlooking the deck and BBQ. Alice didn't like the previous kitchen design's corner sink. So after half an hour's work - here is the adjusted design. ...and other vantage points. The view from the sink. This is a rendering of the west face of the Main House - less the landscaping. A swing on the deck and deck chairs to enjoy the view at sunset in the summer. A view from the Main House west deck - outside the Family Room. The Boathouse is barely visible for the trees. A view of the small Dining Room, from the hallway. A view from the Dining Room corner. The software even lets us import our art. Those are Alice's unicorn pictures on the wall - currently in storage in Calgary. View from the front door in the Foyer. Jane Chacko's art in the distance. Alice needs to add her feminine touch to this area. The Master Bedroom view from the doorway. I couldn't get a better view out the windows - suffice it to say the view to the west (windows to the left) will look something like this - but the windows on the right will only see forest. A private little deck, lots of storage space in closets, and ensuite. And a fireplace, of course. Philip will have an almost identical room - immediately beneath us. He gets a walkout Basement deck and view. After all - this is supposed to be an empty-Nester house. We'll use the space as a guest room after Philip moves out. 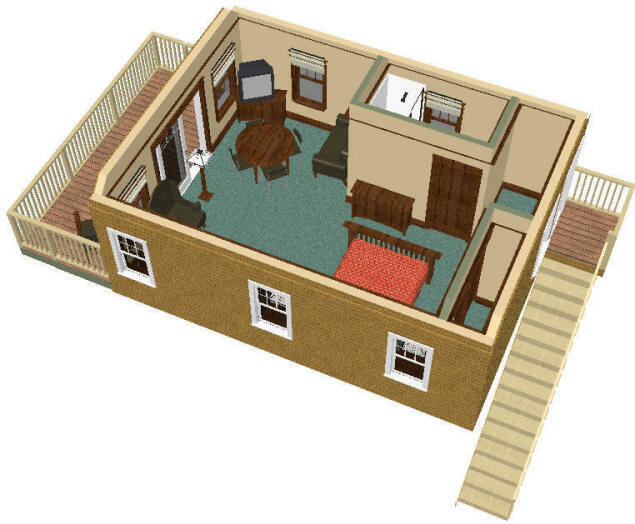 A dollhouse view of the second floor of the Main House. This is Alice's work space. She can set it up any way she likes - with a sewing space, library, or anything else she so desires. Overlooking the public spaces in the Main House. There's even a dormer with a west view towards the water. A rendering of the Diwaniyah from the Main House Kitchen deck. It's bigger than it looks from here. A view of the Main House from the Diwaniyah deck. The water view isn't quite as "deep" as shown here. A view of the Main House and Diwaniyah from the parking area. An approximate view from one of the Diwaniyah's decks, towards the water. We'll have to thin out a lot of trees for this. Even the Boathouse isn't visible from this vantage point. A view of the Diwaniyah from the west face. With no landscaping. Two decks and a central hot tub sunroom. A view of the Diwaniyah from the Garage entrance. The Diwaniyah main floor plan. One large room with a smaller "Snug" on the other side of a two-sided stone fireplace. A Foyer mud room with shower-washroom for guests to change for the hot tub. A small Kitchenette as a bar for the guests. A curved stairwell to the Loft. John's office and workspace. And a separate Sunroom for the 6-8 person hot tub. Just for entertaining. The squares on the plan in the main room are the Persian rugs we'll bring back from Kuwait. A rendering of the 1000 square floor Diwaniyah Main Room. Along with some canned "people" for scale. Alice will need to do a little decorating here. I modeled this room after one I remember at the Itasca Lodge on Lake Itasca in Minnesota. A place I thought was really neat - at the time. A view from the Diwaniyah Sunroom and the larger hot tub. A view of the Diwaniyah Main Room from the loft deck. We should be able to do just about any kind of entertaining we like here. Another view of the room, but from the main floor door to the Snug. Another view of the room - from the Sunroom towards the Foyer. 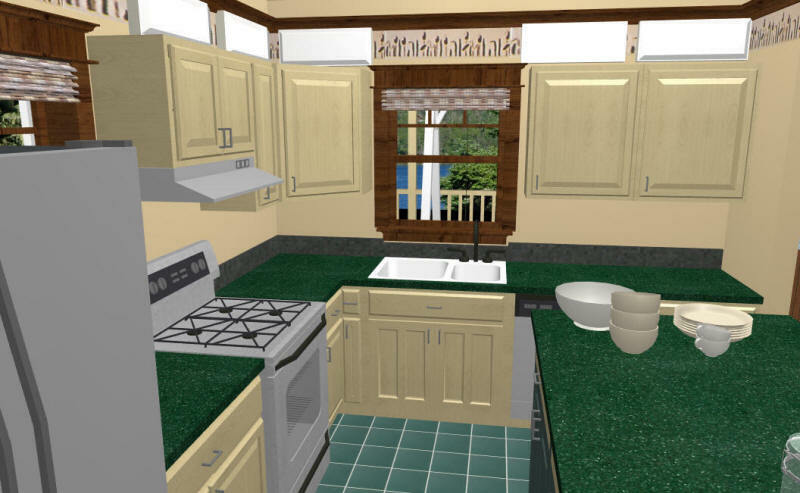 A view of the Snug and Kitchenette. Designed for more intimate entertaining. The second floor Loft of the Diwaniyah. This is John's office and workspace. A view to the west of the Diwaniyah Loft. A view towards the water from John's dormer. The Boathouse barely visible. This should be a fairly accurate view of the water. 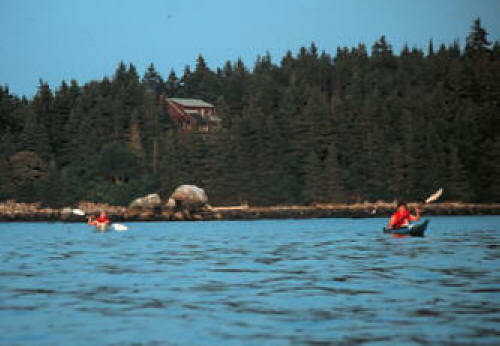 And lastly - the Boathouse, as seen from the water. A small 400 square foot Guest Suite above a large boat Garage. It'll be a challenge to build a railing system to drag the boat from our dock into the Garage - but we'll manage it. Another view from the water side. the Boathouse has a nice partially covered deck to enjoy the waterfront. The Boathouse has ample privacy for our guests. All our friends will be welcome to visit and stay here. A view of the entrance to the Guest Suite on the Boathouse. A dollhouse view of the Boathouse showing the Guest Suite. Another dollhouse vantage point. It'll be like a large motel room. Comfortable enough for a short visit. A view from inside the Boathouse Guest Suite. The water view is very close here. As in all three buildings, there is a vaulted ceiling with a 12-12 pitch roof to maximize the internal space for ventilation. Alice didn't care for the door exposure to the bed in this design - so I offered the following alternative. I think it works just as well. And the bed isn't up against the door this time. I know I'd love to visit this kind of Guest Suite. A relatively accurate rendering of the view from the Boathouse deck. That's about all for this session. I think its 90% done now - just needing some final aesthetic touches. I expect we'll forward these plans to a professional draftsman to get the final diagrams done. 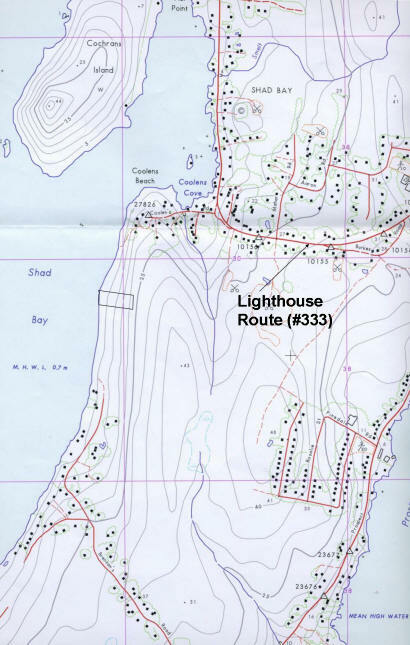 The house would be needed first - the Diwaniyah second, and the Boathouse last. 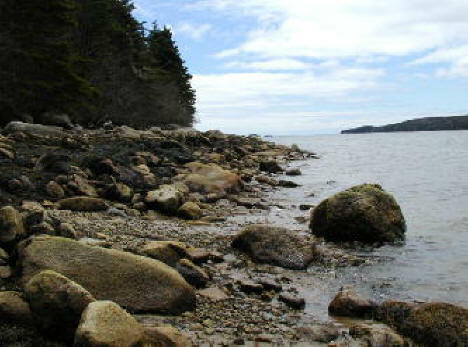 Ocean Front acreage, about 25 minutes to downtown Halifax. 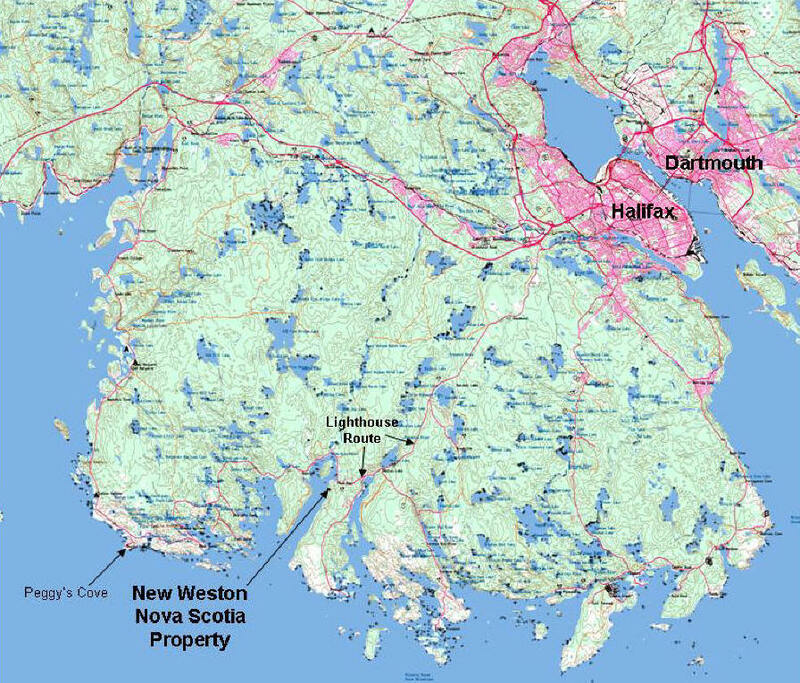 Scanned from a 1:250.000 government map, this shows the proximity to Halifax, and the nearby major tourist attraction - Peggy's Cove. 5 meter surface structure contours. but we learned a while ago we wanted to target west and/or south facing properties for the most comfortable summer evening settings. A 1:10,000 scale property plat from the registry. Showing surface structure contours again. The 2 parcels are also available at the same price at the time we bought ours. We selected the most private, true west-exposure parcel. 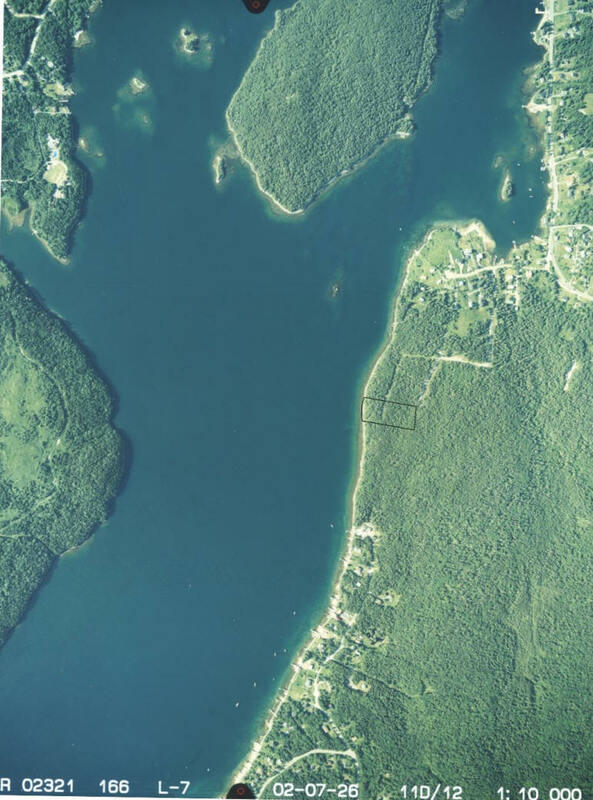 Taken July 26, 2002 - this is the government aerial photo of the area, with the lot outlined in black. True facing - North is to the top, West to the left, etc. 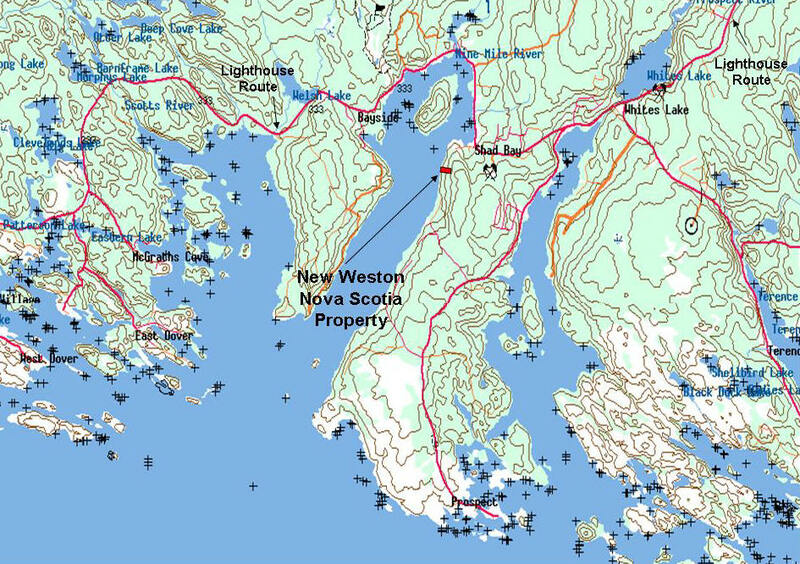 Note the sailboats and docks off the other established properties in the neighbourhood, especially to the south..
Photo taken along the right-of-way about 470' north of the property we've bought. unlike other properties we've seen (especially fresh-water frontage). Biting bugs don't like being close to salt water. Our house view will look something like this. We'll build at least 10 m above sea level. The right-of-way is a little overgrown, but passable View towards the property to the south. Taken in the morning - the sun is to the east behind the trees. This is close to low-tide. Taken from close to water level. The private road to the edge of the property Sign on property showing the subdivision. Ours is the lot S-B - at the top of the sign. 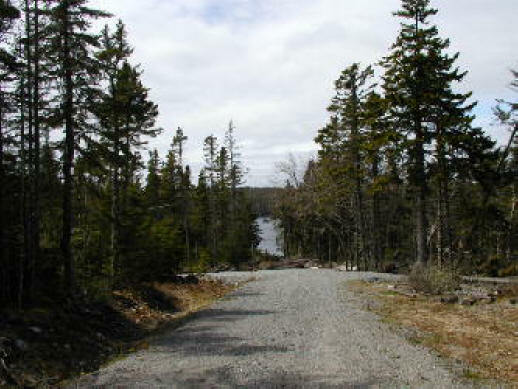 The private road down to the hamlet of Shad Bay to the north. Power, phone and cable are already in place to the property line. Our property starts at the end of this road. The following photos are from the Realtor's web site. 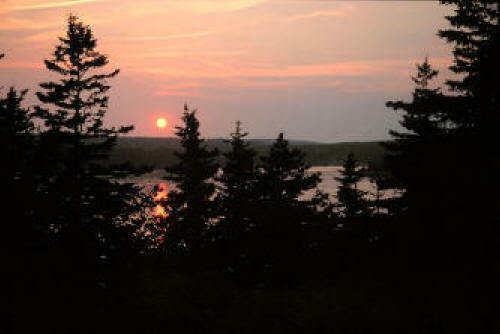 Sunsets over the water from our deck should look something like this.... Cannon Rock - a prominent local topo feature. In our line of sight. Low tide is about a meter from high tide. The old-growth trees right to the top of the high tide level shows little additional water fluctuation occurs. 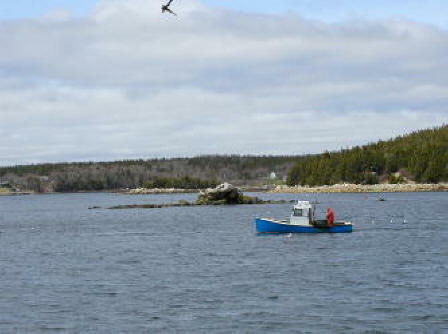 Sheltered cove, suitable for water sports like these sea kyakers. The right of way to the waterfront. Our acreage is about 500' to the left on the road. Alice walking back from the waterfront on her first visit to the land. 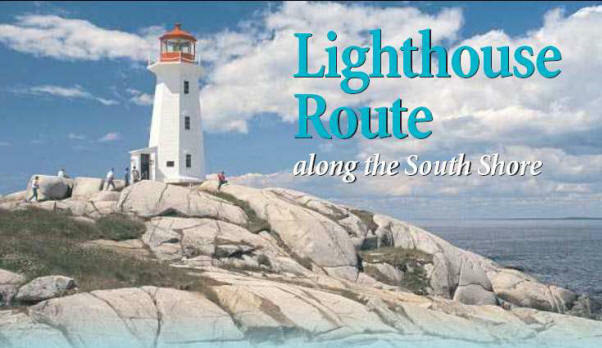 World famous "Lighthouse Route" south of Halifax, is just about a mile from the property. Peggy's Cove about 7-8 km away. A major golf course about 4km away. Minor shopping about 10 minutes away, and major shopping about 20 minutes. Pretty much all the amenities we need and want - more than close enough. This is a quick schematic plot to show the basic layout as I see it - as of August. A smaller empty-nester house of 1100-1200 square foot (footprint), with a 400 square foot loft, and a full walkout basement. Energy efficient R-2000 design. Not intended for entertainment - that's for the detached Diwaniyah. A 2000 square foot lodge, or Diwaniyah, for entertaining, with attached 2 car garage and hot tub. Diwaniyah comprised of 2 rooms - one large party room, one smaller "snug", separated by a large stone fireplace. A smaller boathouse-guest house on the waterfront. With a dock to deeper water for our boat one day. Plenty of privacy for everyone. ecologically-friendly protective covenants of the subdivision. As we develop more plans - we'll post them through our Latest News web page.